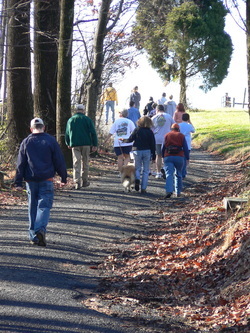 The Chinqua-Penn Walking Trail is part of the NC Birding Trail, with over 150 species identified. 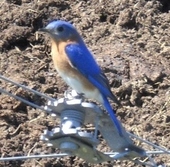 The varied habitat attracts woodland birds, such as warblers and woodpeckers; grassland birds, such as meadowlarks, bluebirds, and hawks; and waterfowl, such as herons, kingfishers, and geese. Rock quarried near the trail was used for Jeff and Betsy Penn’s mansion, but also for the Rock Dam, Pump House, and Summer House at Lake Betsy. Near the trailhead are ruins of the Stew Site where the Penns entertained large parties with his famous Brunswick stew. Stone tables, benches, chimney, firebox, and Springhouse mark the site. Numerous wildflowers abound, including mountain laurel beside Lake Betsy, rhododendron along the woodland trail, and springtime flowers at the Summer House. Bamboo hides the lower quarry at the Rock Dam and shades Little Niagara, a tiny waterfall on Betsy Branch. The Trail was created in 1997 by the NC Upper Piedmont Research Station for the benefit of the public. Friends of Chinqua-Penn Walking Trail have partnered with the Research Station to care for the trail since 2010. Other nonprofits sharing in this effort are the Dan River Basin Association and the Rockingham County Naturalist Club. Generous grant support from the Reidsville Area Foundation has funded grading and gravel for the parking lot and trail improvements, as well as the solar-ventilated composting toilet at the trailhead. In June 2015, the Trail was selected to join America's National Trails System by the Department of the Interior, that recognizes existing trails that link communities to recreational opportunities on public lands and in local parks across the nation. The guidelines of the Trail are simple and designed to improve everyone's enjoyment. The Trail is only for walkers, joggers, people with strollers, and people with motorized wheelchairs--no cycles, horses, or motorized vehicles. Well-behaved dogs on leashes are welcome. Please don't let your dog poop where people walk. Please take out all trash that you bring to the Trail. Thank you for picking up any stray litter. Trash cans and recycling bins are provided at the trailhead. Please respect the wildlife--keep your distance and do not feed the animals. Please leave the flowers for others to enjoy.